Loneliness has become a major health issue. A contributing factor is our overuse of social media screen time that is substituting for a real connection to others. Turning off our smart phones at dinner time and walking with a smile on your face can make a difference. Holidays can be stressful, not to mention hard on our wallets, weight and time. Health & the City offers tips to help manage your holiday sweet tooth and food expense, put a little fitness into your festivities, and reduce the stress that comes with holiday prep. Research says even an hour a day on any kind of screen (TV, smart phone, ipad, computer) increases kids' craving for unhealthy foods. 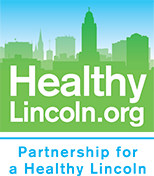 A five-year, $3.3 million federal grant will allow Partnership for a Healthy Lincoln and partners to continue its work to reduce health disparities among racial and ethnic minorities in Lincoln. Health & the City looks at the work of Lincoln's Community Learning Centers and the impact they are making on the lives of kids and their families. Street Alive! 2018 is Sept. 23, hosted again by the Belmont neighborhood. New this year, a collaboration with Lincoln Calling music fest, a fun run/dog walk, a first look at the Streets Alive! Belmont Community Development Project in progress. Team sports can help fill in the fitness gaps left by reduced PE and recess minutes in school, but not all families have the time or resources to take advantage of school sports. Community partners broke ground today for the first ever Streets Alive! community development project, a covered outdoor shelter in Belmont Park. August is national breastfeeding month. World and American health professionals have been concerned lately about the seeming lack of support from the White House. What does the latest research say about breastfeeding and where can families find help? The 5 day (Sept. 17- 22) music festival, Lincoln Calling, and the Streets Alive! outdoor movement festival (Sept. 23) are collaborating to bring Lincoln Calling musicians to Streets Alive! and Streets Alive! wellness and fitness focus to Lincoln Calling. GOING HUNGRY AND THE OBESITY EPIDEMIC IN OUR CITY- How does the obesity epidemic and going hungry exist side by side in Lincoln? It's more complicated than you think and there are organizations trying to address both. Summer programs and active opportunities offer kids and families an alternative to "I'm bored." Health and the City explores ways to keep families active, safe, and healthy over the summer months. Kids can lose the fitness gains they've made during the school year with an inactive summer. Since fit kids do better academically, here are fun and helpful tips on keeping your child active and healthy over the summer months - ready for the next school year. Early giving for the 2018 Give to Lincoln Day begins on May 1. Two worthy causes include HealthyLincoln.org's WeCook and Belmont Community Development Project. The Lincoln Journal Star column, Health and City looks at ways to stay in shape and protect the earth at the same time. Fruit Juice, Healthy or Not? The latest Lincoln Journal Star Health and the City column looks at fruit juice. How much is too much? Is it just another sugary drink? Partnership for a Healthy Lincoln received a national award from the American Cancer Society, one of only 7 awarded nationwide for leading the Nebraska Physicians Cancer Screening Project. March is Nat'l Nutrition Month and Nat'l Colon Cancer Awareness Month. Eating healthy isn't just good for your weight and general wellness, it can help protect you against several kinds of cancers. Read more. Are kids getting enough structured and unstructured physical activity in school to be healthy and learn better? Health and the City looks at the benefits of Phys Ed. to child health and academic success. December's Health & the City column gives simple tips for a healthier you in 2018. November Health & the city column gives tips on how to stay healthy and active during cold weather. October's Health & the City column provides tips on how to fight back against holiday food excess and inactivity that starts with Halloween and goes through Super Bowl Sunday. PHL's President Dr. Bob Rauner and LPS P.E. Curriculum Specialist, Dr. Matt Avey talk about the importance of fitness and P.E. to the health and academic success of LPS student. Lincoln about to capture the National Bike Challenge crown; the summer food program feeds 107K kids; WIC gives out 45K diapers to babies in need; the Streets Alive! festival welcomed thousands; and more. All city channels have rebranded. Lincoln's health and wellness channel is now LNKTV Health. Other city channels include LNKTV Education for educational programming and LNKTV City for government information. The July 22 Health and the City column explores what's myth, what's fact about fats, diet drinks, late night eating, and more. "Nudging" is a sales tactic that lowers resistance to nutritionally bad for you impulse buys at the checkout counter, and it works. Some Lincoln clinics have formed an Accountable Care Organization that focuses on wellness and prevention, led by Steve Kros and Dr. Bob Rauner. The Belmont Neighborhood will host Streets Alive! this year and benefit from a community project in connection to the outdoor festival. This month's column looks at ways to lower the risk of cancer. Also, preventing several cancers with the HPV vaccine for kids. This month's Health and the City column looks at all things cycling in honor of National Biking Month. Lincoln looks to retain its title. Researchers analyzing 95 studies that included 2 million people found that doubling (from 5 to 10) the servings of fruits and veggies in people's diets could prevent as many as 7.8 million premature deaths worldwide each year. Women who ate poorly as teenagers were more likely to develop early breast cancer, researchers reported in a new study. They found women who ate the most inflammatory diet - heavy in red meat, sodas, sweet foods and white flour - were up to a third more likely to develop breast cancer in their 20s, 30s or 40s compared to women who thrived on salads and whole grains. New study says daily sugar-sweetened beverage intake alters human brain and behavior. Read more. Standing up and walking around for five minutes every hour during the workday could lift your mood, combat lethargy without reducing focus and attention, and even dull hunger pangs, according to an instructive new study. A diet high in saturated fats and sugars, the so-called Western diet, actually affects the parts of the brain that are important to memory and make people more likely to crave the unhealthful food. A veterans organization in California took some abandoned land and in relatively short time, transformed it into a garden sanctuary of healing for local veterans and an exciting place of learning and growing for the children. A sugar industry group paid for studies that underplayed the role that added sugars play in heart disease, researchers reported Monday. Lincoln breastfeeding rates are improving thanks to the Lincoln Community Breastfeeding Initiative and its Community Breastfeeding Educators.The program employs a culturally diverse group of breastfeeding women to provide peer-to-peer support to immigrant and minority women, helping them overcome the fear, stigma and challenges of breastfeeding. Community Crops has brought good nutrition to the heart of the city with their mobile farmer's market. The Veggie Van will offer fresh, locally grown produce at 23rd & O Sts., serving neighborhoods where access is limited. Mark Your Calendars for 2016 Streets Alive! Partnership for a Healthy Lincoln has announced the date, Sunday, Sept. 25, for this year’s annual free outdoor movement festival, Streets Alive! Streets Alive! encourages people to get off the couch, go outdoors and move up and down a stretch of city blocked off from traffic. Visitors can bike, skate, walk, stroll, wheel (any kind of human powered traffic) or even dance their way down a two-mile route lined with exhibitors and entertainers. Streets Alive! is a child, dog and wheelchair-friendly event. McDonald's & Black History Month - A Marketing Ploy? Critics call their promotion a flimsy distraction from their unhealthy food and low wages, claiming McDonald’s has a long history of playing up its role as socially responsible neighbor to the African American community while contributing to their health problems. Read more. The House voted Friday to make it easier for you to avoid the harsh truth of how many calories you're devouring as you scarf down that pizza. Jack in the Box has removed sodas from their kids' menus, joining others like McDonald’s, Burger King, Wendy’s, Dairy Queen, and Applebee’s which have all made similar moves, along with Subway and Panera, which never had soda on their kids’ menus. Food Ads Make Us Fat? Public health advocates say food ads should be tightly regulated. They say food companies use them to entreat us to indulge in fattening products and they link our obesity epidemic to unhealthy foods we see on TV.